Yesterday was a really productive day. After a 30 minute jog first thing, I decided to drive to Spey Bay, in Morayshire, Scotland, to do a vlog and get a couple of images. When I set out, there was a thick sea fog over the entire area but by the time I made it to this location, it had more or less completely burned off. This put somewhat of a damper on my thoughts of a moody, very long exposure so I had to work with what I had. Which, to be fair, wasn't a bad thing as the light shining off the pebbles on the beach made for a stunning scene. Yeah baby!!! 4 second exposure from the sky with the DJI Mavic Air and PolarProND64PL filter. Taking a long exposure image of the landscape from the sea is something I have wanted to be able to do for some time. So glad it is now possible for me. So many new compositions have just been opened up! Today was a great day. I finally got around to purchasing a drone. Its first proper flight therefore had to be over Bow Fiddle Rock. The weather was perfect for flying and, as it turns out, also perfect for photography. So after the flight, I headed down to the shore to photograph the rock so that I had a final image for a vlog that I will put together for the first flight. 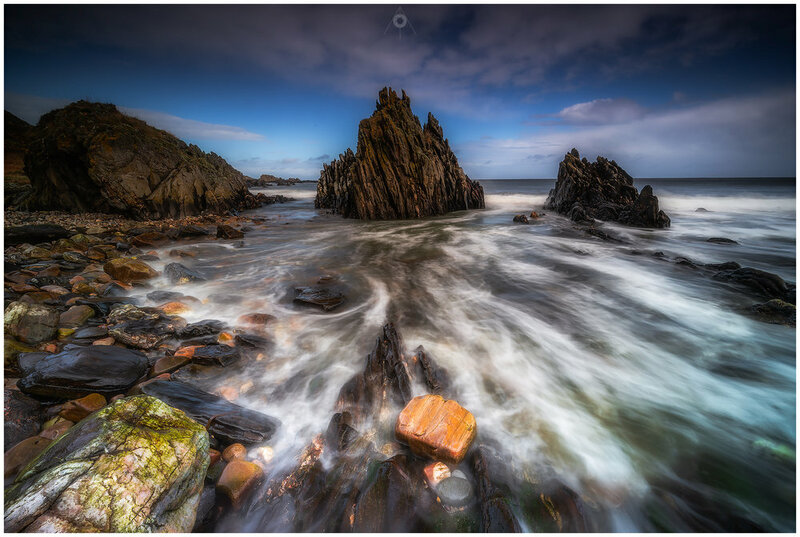 Taken at Portknockie in Morayshire, Scotland. Sunday at Portknockie, on Scotland's Moray Firth, was a slightly more flat day. There wasn't much wind and the sky was largely uninteresting. This made finding a good shot tricky. Fortunately as the tide reached its highest point, some good waves kicked up and gave me an opportunity to revisit a composition from a while ago and see if I could put a different spin on it. Yesterday was such a lovely day so I spent most of it outside with Fara taking photographs and time lapses. It really feels like we have turned a corner and that Spring is almost here, when you are sheltered from the wind, which is still biting! The good weather held out just long enough to create a colourful sunset and fortunately, I was able to find a composition that brought out the best of it. 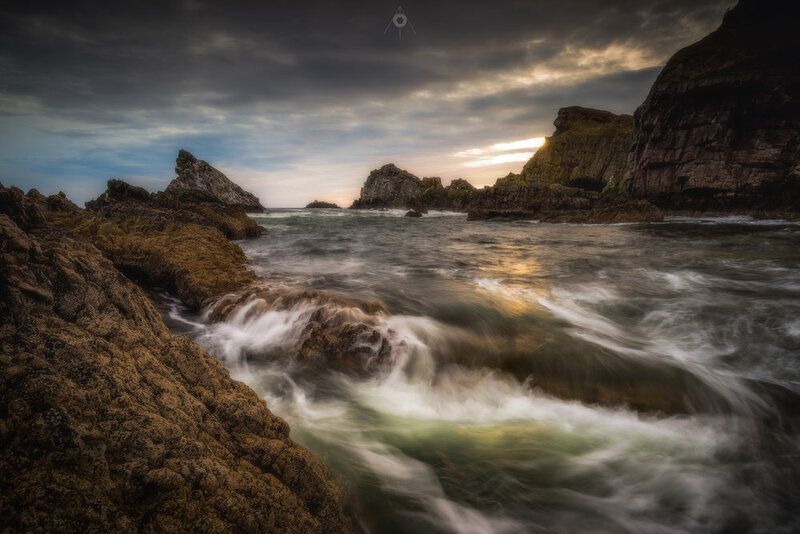 Taken at Portknockie in Morayshire, Scotland. Sunrise at Bow Fiddle Rock at Portknockie in Morayshire, Scotland. Sunrise over Scotland's Moray Firth from Portknockie Beach. Very active seas about 10 days ago have started up again after a spell of very calm and mild weather. I much prefer it this way! Not sunrise or sunset. Just winter in the north of Scotland. The sun never gets very high in the sky at this time of year over Cullen on the Moray Firth. Sunset over the Moray Firth from one of the beaches of Portknockie in Scotland. Sunset over the Moray Firth from the rocks on the shores of Portknockie in Scotland. Waves crashing over the pebbles on the beach at Spey Bay in Morayshire, Scotland. Sunset over the Moray Firth from the cliff tops of Portknockie in Scotland. 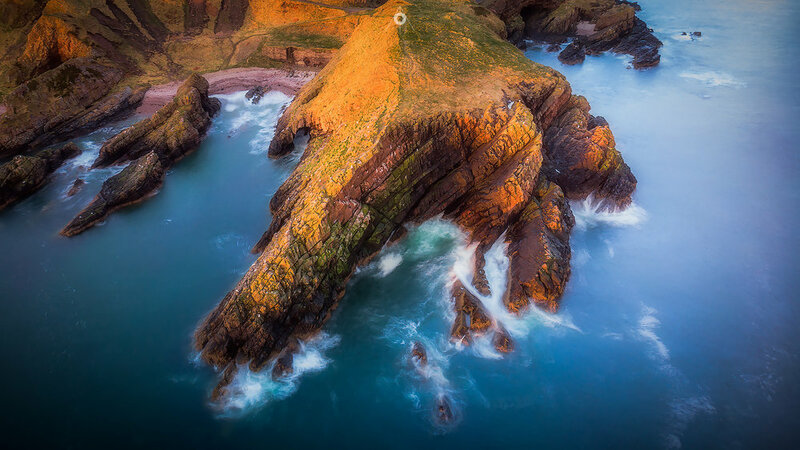 Shotten Craig from the cliff tops of Portknockie in Morayshire, Scotland. Sunrise over Bow Fiddle Rock near Portknockie on Scotland's Moray Firth. Sunset over the Moray Firth from a beach in between Portknockie and Findochty in Scotland. A beautiful, spring sunrise over the rocks on the shores of Portknockie in Morayshire, Scotland. A sea stack off the coast of Portsoy in Aberdeenshire, Scotland, on a dark and stormy day.